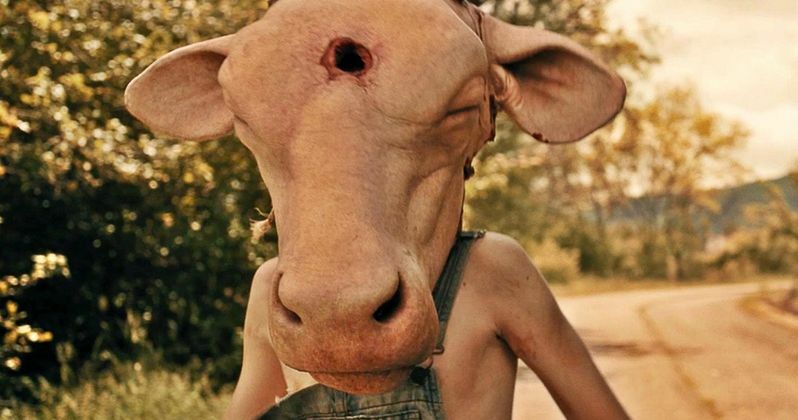 Liosngate has debuted a new clip for Leatherface, which delves into the origins of the title character at the heart of the gruesome events portrayed in Texas Chainsaw Massacre. This new clip gives us our first look at Verna Sawyer, the mother of the child that will eventually become the title character, along with a vindictive Texas Ranger named Hal Hartman (Stephen Dorff). It's clear that Verna and Hal have quite a bit of history. The clip debuted on Yahoo! Movies, just as this movie becomes available in an exclusive early window for DirecTV subscribers starting today, before the movie hits theaters October 20. The clip shows Verna angrily confronting this Texas Ranger, who has one of her young sons locked up in the back of his squad car. Verna protests that he has no right to do that, when the Ranger explains that the young boy isn't actually under arrest, but instead, he's under the law's protection, from her. It is never revealed who exactly the young boy is in the back of the squad car, but it seems that Hal plans on taking all of her children. Hal goes on to explain that he can't remember a crime scene he's been to where there weren't already Sawyers there before him, stating that her sons aren't safe with her. When Hal orders his men to bring in all of the minors from the Sawyer house, Verna protests, stating that he can't do that, but Hal has the law on his side, stating he'll have a warrant that allows him to take the children on grounds of child endangerment. The clip ends on quite the cryptic note, hinting at a much deeper divide between this Ranger and the Sawyer family. Hal reveals at the end of the clip that, if she, "takes one of mine, I'll take all of yours," indicating that this is definitely a more personal vendetta than a professional visit. In Texas, years before the events of the Texas Chainsaw Massacre, in the early days of the infamous Sawyer family, the youngest child is sentenced to a mental hospital after a suspicious incident leaves the sheriff's daughter dead. Ten years later, the Sawyer teen kidnaps a young nurse and escapes with three other inmates. Pursued by authorities including the deranged sheriff out to avenge his daughter's death, Sawyer goes on a violent road trip from hell, molding him into the monster now known as Leatherface. The cast includes Sam Strike, Sam Coleman, Vanessa Grasse and James Bloor as the four inmates who escaped from the mental institution, one of whom will be revealed as the real Leatherface. French filmmakers Julien Maury and Alexandre Bustillo direct from a screenplay by Seth M. Sherwood, with Carl Mazzocone, Christa Campbell, Lati Grobman and Les Weldon producing. After the month-long exclusive release for DirecTV subscribers, Leatherface will hit theaters and other on demand formats October 20, which is currently the busiest weekend of the year. While Leatherface won't get a wide release, there are five more movies that weekend that will, with Warner Bros. Geostorm, Lionsgate's Boo 2! A Madea Halloween, Sony's Only the Brave, Universal's The Snowman and PureFlix's Same Kind of Different As You. Take a look at the latest clip from Leatherface below.